A hat tip to Gail the Actuary of the Oil Drum. It should be noted that Gail's comparison underestimates the full comparative cost of wind. 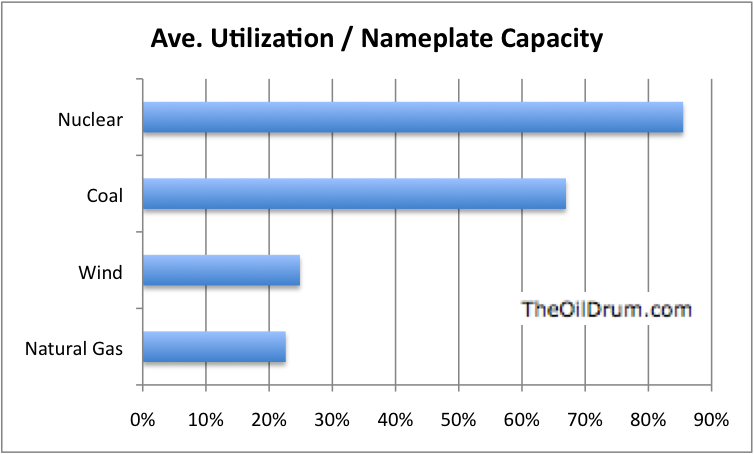 It does not included the costs of new transmission lines, or the cost of load balancing. The wind facility will have to be replaced after 20 years, while the reactor will last 60 to 100 years. Link: What does Sustainability Mean for Energy? Did you notice "I would think the ultimate energy would be something other than uranium based nuclear. Perhaps thorium based nuclear, if we could figure out how to do this, and scale it up in a sensible manner." Ya, Bill I guest posted for Gail on the LFTR. What I wonder is what kind of sucker trap these landowners/farmers, who agree to have wind turbines placed on their property, are getting into. The Wind Turbine Lobbyists claim that they are 90% recyclable, but what they neglect to mention is that the major difficulty and cost of recycling is to get proper permits and environmental license for safe disposal, tear the damn things down, dismantle them, and break them up into pieces for large trucks to haul off. Try hiring a giant crane and a crew of high priced demolition people to come in and tear down those contraptions, likely leaving a huge reinforced concrete pad on your good agricultural land. From what I’m reading, when the subsidies dry up, when utility companies don’t want the unreliable wind energy, when maintenance costs and royalties on the turbines exceed income, when much cheaper factory produced nuclear comes on stream, then the landowner is going to be stuck with a rusting, noisy ( bad bearings and blade imbalance are certain), and hazardous monstrosities on their once pristine land, monoliths to a failed experiment – letting greenies with no common sense and no technical skill decide energy policy. South Point Wind Turbines – how ugly is that? ... unless wind proponents consider that running existing coal plants in hot standby to pick up for wind variation is acceptable. It just happens to be horribly fuel-inefficient and even more polluting for SOx, NOx and particulates than running the same coal plant at in its normal operating range. Abnormal temperature and gas flows in hot standby can degrade enormously the performances of pollution control systems. Anonymous I tried a different tract to figure the cost of wind back up. 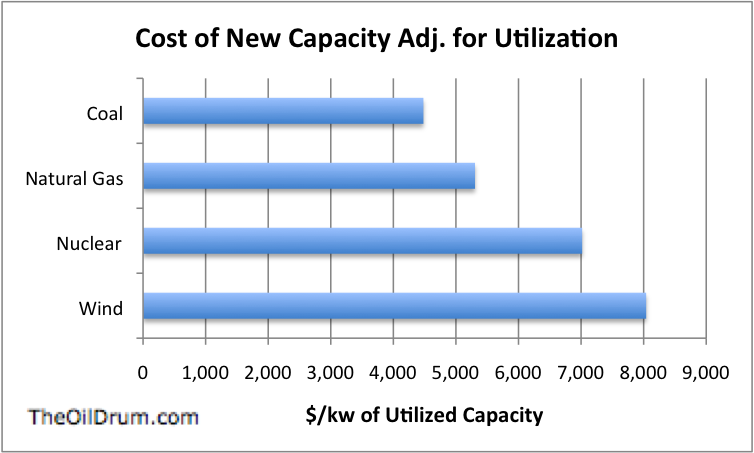 In assessing the cost of post carbon wind, I looked at the cost of 4 potential backup systems. They all had a similar range of costs, and all were probably going to cost more than nuclear. Indeed it is possible that some renewables advocates are beginning to have second thoughts about the potential of wind as a post carbon energy source. "Indeed it is possible that some renewables advocates are beginning to have second thoughts about the potential of wind as a post carbon energy source"
No, that is not possible. If they indeed started to think logically, they could no longer be renewable advocates. But if they are still renewable advocates, then they can't have second thoughts, because they would have to have had first thoughts first. And that is highly doubtful. Like I posted elsewhere, nuclear needs backup powerplants and has weird grid requirements too. This is because of the huge unit size, which can go down all at once. It's different from wind, but don't act as if there are not these issues. That is, if this blog really tries to be a honest look at energy issues. gravityloss, You appear to be unacquainted with my views, I support the construction of small rather than large nuclear power plants. I never deny that reactors can be tripped and shut down quickly with a large loss of generating capacity. However such problems are exceptional for nuclear plabts while the intermittency of wind presents a significant and constant problem for grid managers. You appear to not understand that my primary concern is the problem of managing a post carbon grid without fossil fuel backup. Nucs can back nucs up, but why would you want to back up wind with nucs? and if you don't back wind up with nucs, how would yo do it? "While this is a good exercise to get the mind thinking about the various consideration, my experience with having done this type or ranking exercise for a living is they often turn out to be little more than a formal way of displaying ones opinions and biases." It seems to me this commment is just as appropriate to Jacobson's latest work.